Documentary Screening and Discussion. Rafael Guastavino: "El arquitecto de Nueva York"
2 Arrow St. 4th floor. Thu., Nov. 9, 2017, 5:30 – 7:30 p.m. 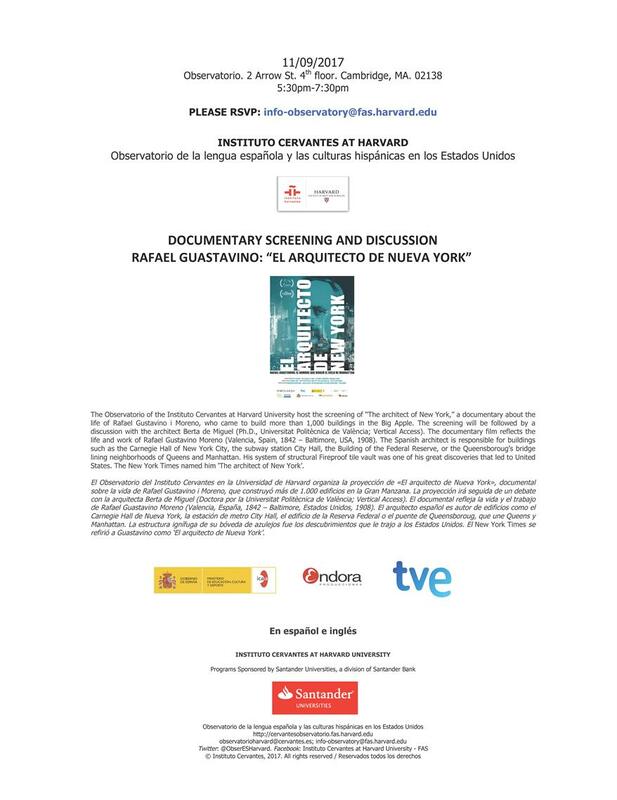 The Observatorio of the Instituto Cervantes at Harvard University host the screening of “The architect of New York,” a documentary about the life of Rafael Gustavino i Moreno, who came to build more than 1,000 buildings in the Big Apple. The screening will be followed by a discussion with the architect Berta de Miguel (Ph.D., Universitat Politècnica de València; Vertical Access). The documentary film reflects the life and work of Rafael Gustavino Moreno (Valencia, Spain, 1842 – Baltimore, USA, 1908). The Spanish architect is responsible for buildings such as the Carnegie Hall of New York City, the subway station City Hall, the Building of the Federal Reserve, or the Queensboroug’s bridge lining neighborhoods of Queens and Manhattan. His system of structural Fireproof tile vault was one of his great discoveries that led to United States. The New York Times named him ‘The architect of New York’. (In Spanish and English).